Social experts Unruly review the latest viral from Beat by Dre. It’s a good time to be Serena Williams. The all-conquering tennis star’s recent US Open victory was the 18th major title of her much-celebrated career, putting her alongside legends Chris Evert and Martina Navratilova on the all-time Grand Slam winners' list. Not bad for someone who is still only 32 years old. But it’s not all bouquets and blooms for the high-profile tennis ace, as the latest ad from Apple-owned Beats by Dre shows. The headphone brand puts the spotlight on the punishing gym routine that has made her such a power on the court - and, well, it’s enough to bring you out in a cold sweat just by simply watching it. 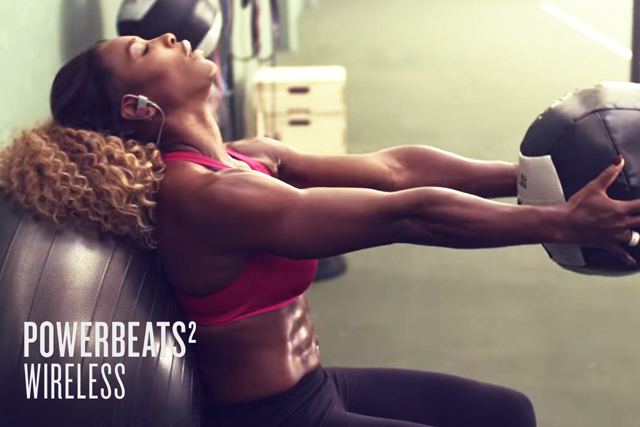 The ad shows Serena working out in a gym while wearing wireless Beats headphones. Beats is a brand which is certainly getting a reputation for its stylish, inspirational ads, which look more like slick music videos than commercials. And "Nothing Stops Serena", which features a rousing track from 2 Chainz called "Black Unicorn", is no different. The choice of track - with its inspirational lyrics about struggle and success - is perfect. Like so many other Beats ads, it also looks great, showing some beautiful visuals of Serena working out, all seamlessly interspersed with shots of Williams' hometown of Compton, where Dr. Dre also grew up. However, despite its undoubted swagger and slickness, it has so far failed to serve up a surprisingly small amount of sharing success for the headphone brand. From its 1.1 million views so far it has attracted 16,000 shares, which means only 1 in 68 people who have seen the ad have been moved to click the share button. As research consistently shows, star power very rarely means sharing success. Look at the most shared ads of all time and very few feature celebs. In fact, when you consider a similar(ish) ad from Under Armour, which stars a little-known ballet dancer called Misty Copeland, managed five times more shares in less than half the time, you could even make the argument that not only does star power not help drive shares, it also hinders. Why? Because when you’re trying to inspire viewers, it’s better to use someone who is more accessible; more likely to appeal to a wider audience. Serena looks amazing, but her physical attributes and athletic abilities are simply out of reach. Copeland’s story was also more compelling. That’s a shame, especially when you consider that one thing it does deliver is ‘valuable virality’, with the product at the centre of the ad throughout. The whole ad is simply a very stylised (and probably very expensive) product demo. With a bit more emotional clout, it could have served up some big net gains for Beats.